Newtonian Telescope 192/950 mm on equatorial mount. Astrosolar d5 filter -> 185 mm aperture. Very good weather when starting observations (no wind, clear sky, but Sun very low). few degradation in the morning caused by high clouds in height and irregular wind. The progress of Venus in front of the solar disk was then filmed with the webcam from 05:26:30s UT at the rate of 1 "AVI" of 30 seconds every minutes during 30 minutes. An animation allows to reconstitute a speeded-up movement. Determination of the instant of second contact from the video 05:39:30 - 05:40:00 UT. Groups of 10 images, chosen among the least deformed by the turbulence and framing the moment of 2nd contact, were separately handled to obtain this sequence. The hour mentioned under each view is the arithmetic average of 10 moments corresponding to the images of each group. The end of the transit was also followed with the webcam, from 10:54:00s UT at the rate of 1 "AVI" of 30 seconds every minutes during 30 minutes except for the last one who lasted 1 minute. The presence of wind and the nearness of roofs warmed by the solar radiation strongly increased the turbulence. An animation allows to reconstitute this speeded-up movement. (Same method than second contact). 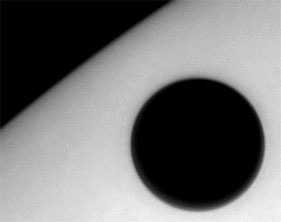 Few images extracted from the video of the begining of the transit show a brilliant arc resulting from the illumination of the atmosphere of Venus by solar light. 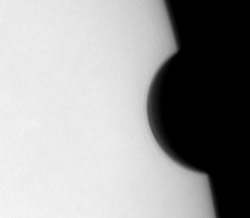 Capture of monochromatic images was done with the spectroheliograph. We can note the poor solar activity. Very small sunspots was visible near the center of the disc. 2 groups have been filmed with the webcam (NOAA 0627 et NOAA 0628) and are visible at the page "archives 2004". Images taken with film will be inserted later. The discovery on my images of the atmospheric arc of Venus was also a moment of surprise and lively interest. The phenomenon of "black drop" was not recorded. It is certainly connected to a strong turbulence and\or to an instrumental cause. The diverse shots were obviously interrupted with visual observations. What I imagined to be a small black disk walking on a big brilliant disk showed in fact to be a surprising spectacle : the vision of a planet orbiting around its star. Finally, and although that is not a real surprise, the precision of the forecasts in celestial mechanics is always so surprising.